My sister got married at the weekend and I have to say it was the most amazing day that we could have hoped for. Both her and her husband looked so happy the whole day. I was very proud to see my little sister married to someone who makes her very happy indeed, and for me I inherited a new brother-in-law. Though to be honest, he’s been hanging round for so long he’s become part of the furniture! My wedding preparations started on the Thursday, when me, a friend of the family, Karen, my mom and a few more volunteers began the mammoth task of baking, icing and decorating over 160 cupcakes! I have never baked for such a large number before but I surprisingly found it really easy to do. The mixture is the same, it is just doubled, and you need a lot more room to cool the cakes. Transporting them was a little bit more difficult but with some large boxes and a little bit of genius from my dad we managed to get them all down to the venue in their 160+ pieces… all looking perfect. To make these cakes I used a very simple vanilla cupcake recipe, we then topped the cakes with little ‘hats’ of icing, which were circles of white icing and then used buttercream with a rose effect icing nozzle to pipe onto the cakes. 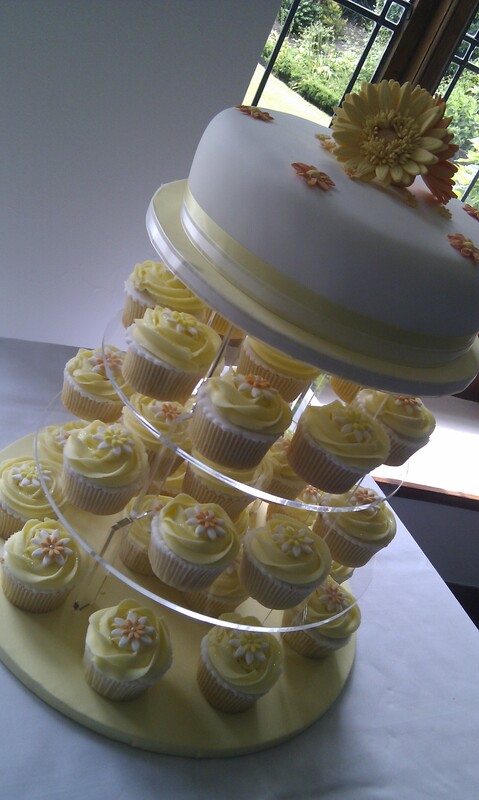 Finally, we added a little glitter and a small icing flower that we had made a couple of weeks before… and voila! Cupcakes, lots of them. I wouldn’t suggest trying to make 160+ all by yourself (unless you are a professional) because the time and friends needed to bring it all together would mean you would be working long into the night, but 24 are very easy and manageable to make and look brilliant on a cake stand. We made very large cupcakes because we needed them to look impressive so if you want to do this recipe then I would suggest using a case slightly smaller than a muffin and also baking them in a muffin tray, which has plenty of room. We used Lurpak (brand) butter because it is a lighter colour. For every amount of butter use double the quantity of icing sugar plus 1-2 tsp vanilla essence. Icing flowers – we made our own using fondant Icing, white and coloured. We cut out 2 sizes of flours, the large being white and the smaller coloured and put them together with a small edible ball in the centre. 1. In a large bowl combine the sugar and margarine till it is soft and changes to a lighter colour. You can’t do too much mixing at this stage. 5. Keep doing the same till all 6 eggs have been used up and all of the flour. If you have a little bit left of the flour then put that in afterwards. 6. Give it a small mix but not too much. 7. Divide the mixture into 24 large cupcake cases – make sure you fill them to half way, or very little over half way. You don’t want to go too high up the cases. 8. Bake in the oven for 25 minutes. For me this was the exact time, everytime. 9. Once the cakes spring back when poked a little then they are done. 11. Whilst cooling cut out 24 circles which are the same size as the top of the cakes out of white fondant icing. 12. Once the cakes have cooled – using a little warmed up jam, stick the icing hats to the top of the cakes. You want to make sure the tops are covered as this helps stop the air getting to the cakes and makes them last longer. 14. Pipe the buttercream generously onto the cakes and top with a little bit of glitter. 15. Finally, add you flower decorations. Looks really good. Will have to try them, soon.